In 1983, summer started in January. From the beginning of my Christian journey, I wanted to be a missionary. The roots of this desire were undoubtedly formed while reading Maryknoll magazines as a young Catholic girl, and loving foreign languages and geography as an elementary student. As much as I wanted to go overseas, I was bound in a lot of fear, fear of the unknown, fear of a lack of faith and fear that I just couldn’t cut it. But things were going to change. That January, the thought of spending the summer with OM (Operation Mobilization) began to grow in my mind like a carefully planted seed. Because there were other ministries going on in my church that summer, my little solo jaunt across the pond wasn’t getting that much attention. By March, I had raised only the money I had sent from my part-time job (I was a full-time college student at the time), but, I kept praying. During a prayer meeting later in March, Nikki, the meeting leader, mentioned my trip. She asked in front of everyone if I needed support, I felt free then to share my story. Leslie Weber, to my astonishment, wrote me a check for $400, one-third of my support. I was overwhelmed by her generosity. And God’s guiding hand. By the end of May, I had nearly all the money I needed for my summer trip. Every little bit that came my way, whether it be from friends, my tax return or income, was immediately forwarded to OM. I was very diligent in this task. Perhaps too diligent. The weekend before the big departure came. It was Memorial Day weekend, and I was to leave Tuesday morning to catch the Greyhound to Akron for OM’s USA conference; then, together with the other Americans, bus to New York and fly to Zaventum, Belgium. In my excitement and preoccupation in getting my studies and work assignments finished, I failed to purchase my bus ticket to Akron. That Saturday, I realized my neglect. What was I gonna do??? I began to pray in earnest. I was still bound by the faith agreement, so I prayed…I thought maybe someone at church might slip me the money I needed for my bus ticket. Sunday came and Sunday went. Maybe Monday, yes, Monday, someone would come by. Nobody came by, nobody called. Breathe, pray. Late Monday night, I was finishing some work projects. I was nervous, but just kept praying. My mother came in and asked about the trip. She asked about the bus trip, she then asked specifically about the ticket. I said I didn’t have one yet. She wondered how I was going to get it; I said, very weakly, but resolutely, that I would get it somehow. “Good night,” she said.” Night,” I replied. Yikes!!! I went to bed late after finishing all the projects. When I woke up the next morning, my mom had already left for work. On my nightstand was an envelope. An envelope with $200 cash from my wonderful mother. God still blesses his hopelessly harried daughters. 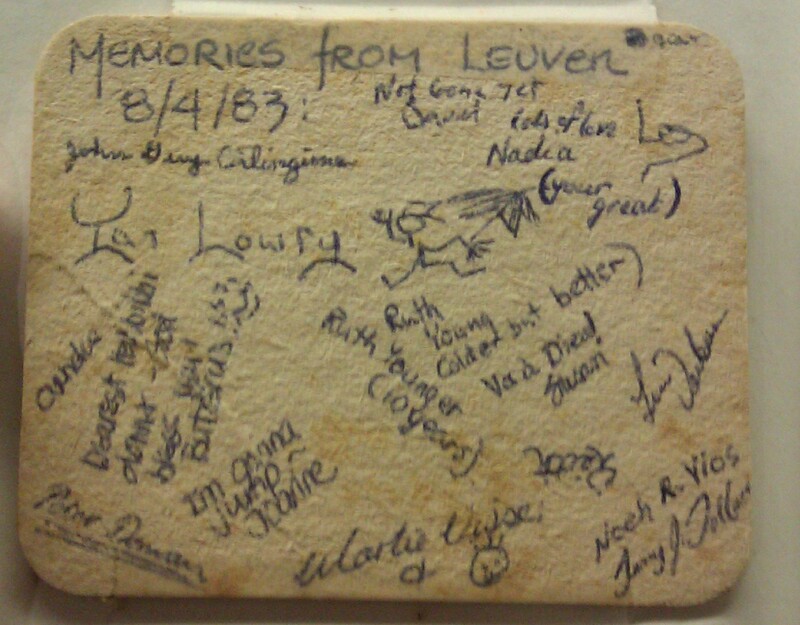 Now, once I got to Belgium, which was and perhaps still is, the main meeting place of all the European and American OM Missionary Teams, I had to decide where I wanted to go. I had planned to go to Ireland, I even designed my prayer letter with Irish decals and old Celtic crosses. But, I’ve learned since that things rarely go as planned. The Irish teams were filled. There was a great need for the Belgian team. I liked Belgium, but I wanted to see a little bit of Europe while I was over there. Alas, after prayer, I decided to stay in Belgium. That choice, that answer to prayer, gave me one of the most pleasurable and gratifying spiritual experiences of my life. The first month, I was on a team of about 14 men and women, and we were living in Ghent. We lived in a kind of trailer with two large rooms, one for the guys, one for the girls, and one small bathroom with only cold running water. We slept in sleeping bags. The trailer must’ve been near a pond or something because there were ferocious mosquitoes which was the only drawback of the summer. We spent our days selling books, doing street theater and other forms of ministry. Often I would run into folks from Spain with whom I was able to use my rusty Spanish to share the Gospel. It was during this time that I discovered that most wonderful of breakfast cuisines: Nutella. Now, the team didn’t have enough money for actual Nutella, so we used a generic chocolate, which was just fine. Also, in Ghent, there were fritter trucks where we purchased french fries with our extra money. These trucks were all over the place. It was a wonderful month. The second month changed for me and my teammates, Susan and Peter. Leo wanted to put together a training team consisting of music directors: Susan and Peter, and a drama team leader: moi. Since I was on a drama team back home, I was chosen to teach the other Belgian teams all of the street theater skits. We were moved to the year-long team’s house, which had hot showers, beds, and no mosquitoes. Yay! Leo spoiled us; he took us out and showed us this wonderful, beautiful, old city. We went to the annual Gentse Feesten. While I worked hard teaching the skits, I grew in confidence. The Lord was changing me. At the end of the summer, there was a final conference in Leuven. I remembered a skit we did in our drama team in San Francisco, and I pitched the idea to Leo. He gave me the go ahead to teach a team of kids, and I directed the Jews For Jesus’ “This is the House that Jacob Built” skit for the entire conference. The team did great. I couldn’t believe I was a part of this work. I went home to continue to help in the drama team, to continue in my faith and to continue to believe God for great things. Today, June 8, 2013, I went to the local library’s book sale. There I found a copy of Amy Grant’s tape “Age to Age” the very tape I listened to 30 years ago with an old walkman while laying on a canvas cot somewhere in Leuven, Belgium. I thank God for this wonderful memory, the wonderful lessons of faith I learned and the wonderful experience of being a part of God’s work in this world. 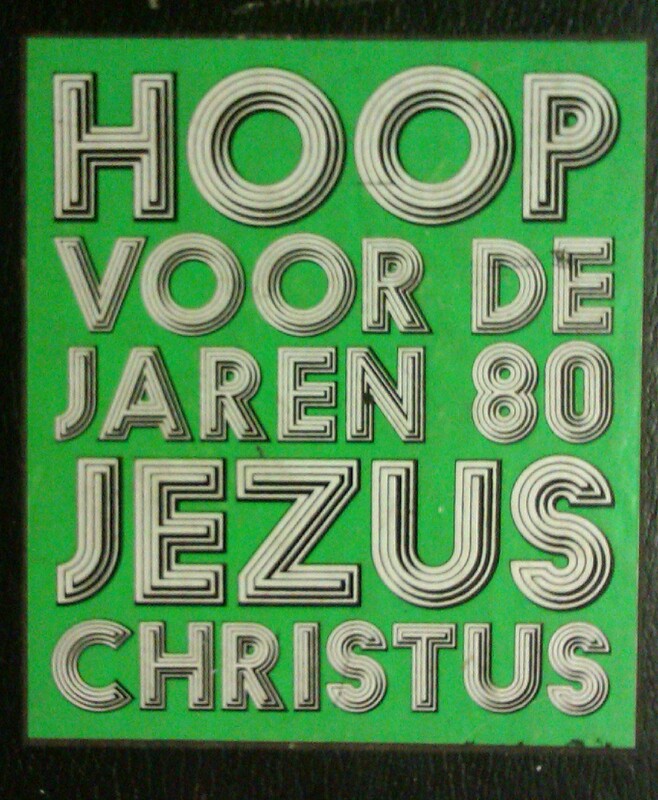 The sticker on my Belgium journal my friend gave me shouts Hoop Voor De Jaren 80 Jezus Christus (Hope for the Eighties – Jesus Christ) – hope, for always – Jesus Christ. That will never change.